I confess myself a peanut lover. My house is full of roasted peanuts, M&M’s, snickers, peanut butter (both smooth and crunchy), crunchy nuts clusters (crispy cereals that contains peanuts and honey -that’s my lovely breakfast every morning -), etc. Regarding to the attraction with peanut butter, I just know two kind of people: those who love it and those who hate it. It’s that radical, yes! Does this apply to you? Which kind of person are you? Today I bring you a recipe which contains peanut butter buttercream. 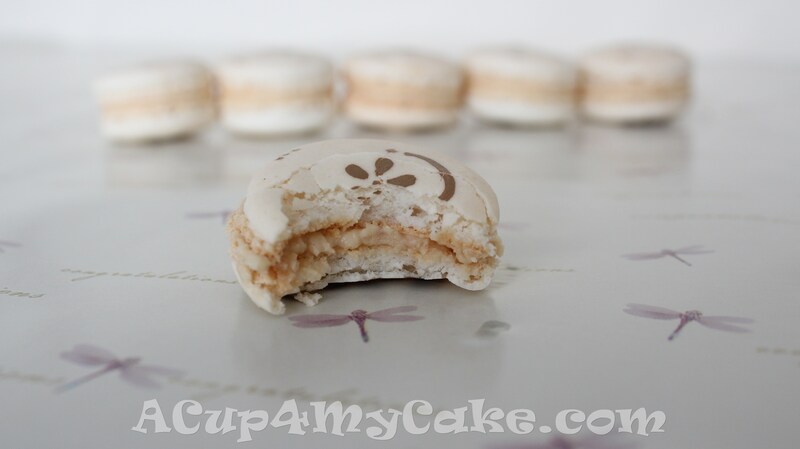 I wanted to make it long time ago and when I finally did, I decided to use it to fill some tasty macarons instead of icing cupcakes (which you can also do!). 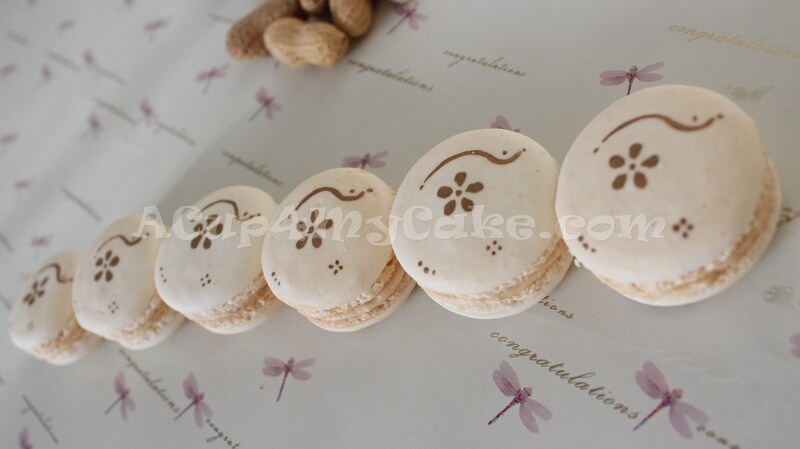 I added a personal touch in each macaron (some hand-brushed details) to make them even more cute. Based on the basic macaron recipe of Annie Rigg. For a more detailed information of the process, please, check out this complete and fully illustrated step-by-step macaron tutorial. 1) Blend the ground almond and the icing sugar together with a food processor for around 1 – 2 minutes. 2) Sieve twice and get rid of large bits. Set aside. 3) Start whisking the egg whites at medium speed and add the cream of tartar when frothy. 4) When the meringue starts whipping, increase to high speed and add the caster sugar gradually (3 additions) and keep whisking at high speed until you get a really creamy, even, glossy and thick meringue. When lifting the beater from the bowl, stiff peaks should be formed on the surface of the meringue. 5) Gradually add the dry ingredients (ground almonds + icing sugar) to your meringue in 3 additions. Gently fold the mixture by means of a silicone spatula (process known as “macarronage”) until get a creamy and shiny batter, with no visible dry ingredients. The consistency shouldn’t be either too runny nor too thick. A large “thick ribbon” will flow when lifting the spatula from the batter. 6) Attach a plain nozzle (#12) to the piping bag and fill it with the macaron mixture by scooping carefully with a silicone spatula. Pipe 3 cm/1.2 inch diameter round shells onto a lined baking sheet. 7) Tap the bottom of the baking sheet against your worktop in order to remove any peaks and/or large air bubbles. 8) Leave the shells to dry for around 1 – 2 hours or until no longer tacky. 9) In a preheated oven at 150 º / 300 F , bake the macarons for around 10-14 minutes. When the foot is formed, they sound hollow when tapping and they’re easily lifted from the baking paper by using a spatula, they’ll be ready. 10) Let them cool for 5-10 minutes on the baking sheet. It’ll be easier to remove the shells from the parchment paper if you do it. Then, place them on a cooling rack and let them cool completely. 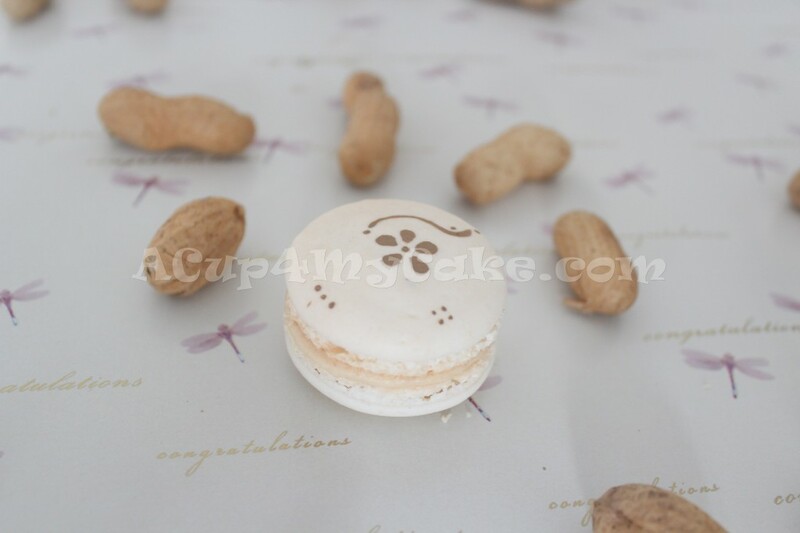 11) Once the shells have cooled, form the macarons by filling them with peanut butter buttercream (see recipe down below). Optional: You can decorate the shells of your macarons by means of a very thin brush and some food colouring (dissolved in a few drops of water). PRESERVATION: You can keep them inside the fridge and consume within 3 days. Bring them to room temperature before consuming. 1) Mix the butter with the peanut butter at medium speed until smooth and fluffy. 2) Add the icing sugar gradually and keep mixing for 3 minutes. 3) Add the milk to thin the buttercream and keep mixing until well incorporated. You can add some more milk if you want a thinner consistency; always gradually, teaspoon by teaspoon. And… the buttercream is ready to fill our macarons! I hope you give them a try and enjoy this lovely and gorgeous bite as much as I did! This entry was posted in Macarons, Recipes. « Chocolate & Coconut Cookie Dough Balls… Delicious & Egg-free! Wow – You are one talented baker and decorator! These macaroons look absolutely delectable! 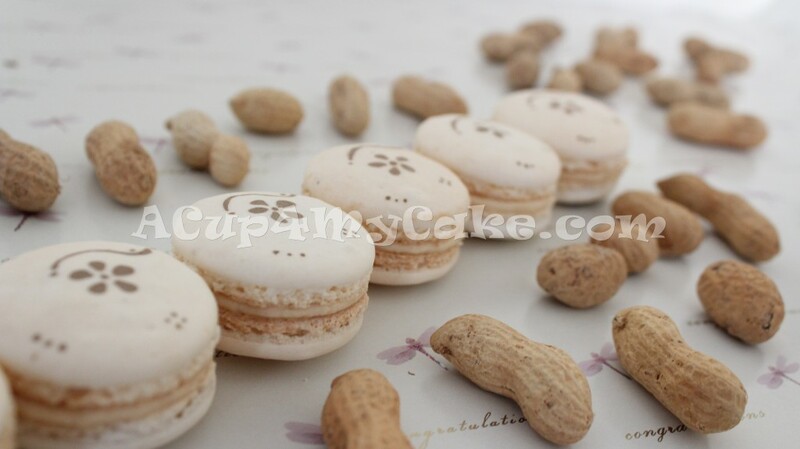 I am always very much impressed by anyone who can make a macaroon and these peanut butter ones seem so lovely. The chocolate flower detail as a finishing touch is also just beautiful. Brava mi chica!